From the dazzling bestselling duo Jane O’Connor and Robin Preiss Glasser, a picture book with a non-fiction twist for the fancy girl who is out of this world! Fancy Nancy thinks that everything in the sky is simply stellar, from the sun and the moon to the stars and their constellations (that's a fancy word for the shapes that stars make!). So nothing could make her happier than a special sleepover under the stars with her dad and her little sister, JoJo. Together, Nancy and JoJo wish on stars, moon bathe, and even eat astronaut ice cream! But when rain clouds cover up the stars, what's a stellar stargazer to do? 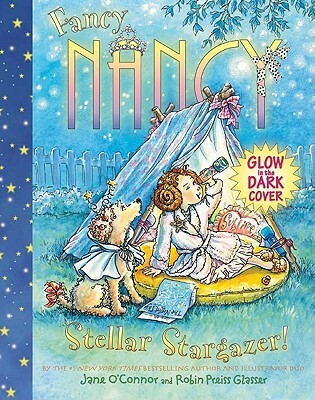 Fancy Nancy: Stellar Stargazer!, full of celestial facts and sparkling illustrations, is perfect for young explorers. Best of all, take the glow-in-the-dark cover outside at night to launch your own fancy stargazing adventure. Ready? Three . . . two . . . one . . . Blastoff!